The weather forecast wasn't promising, even though the morning was fine. But I was keen to get out on the fells. 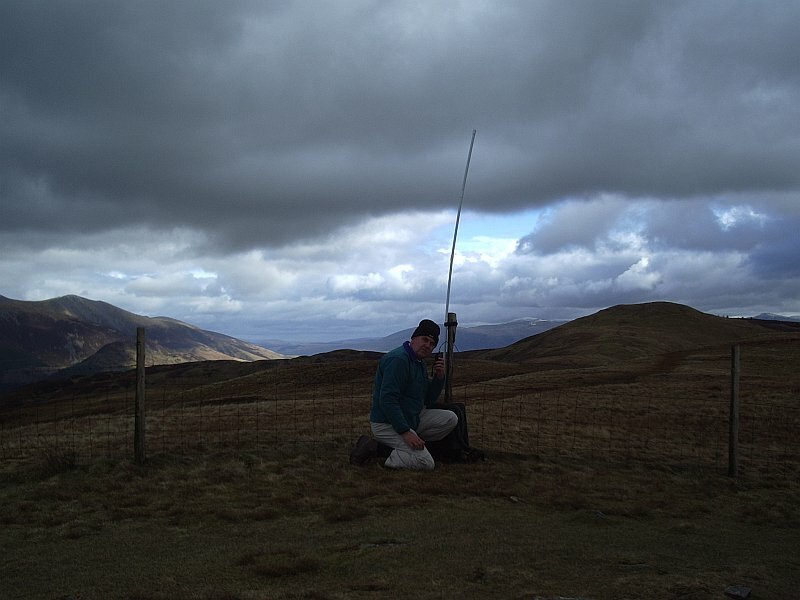 Yesterday I spent a couple of hours making an antenna specifically for Wainwrights On The Air operating and I wanted to try it out. So I headed for Broom Fell, LDW-169. I'd had the idea for this antenna for a couple of years but hadn't got around to making it. I was going to call it the WOTA Pole. As, for reasons I will come to, I'm unlikely to be publishing a detailed description of it, I'll give you the outline of it now. It's a Slim Jim made from 300 ohm flat ribbon cable, housed in a tube made of white UPVC electrical conduit. The tube breaks down into four sections for easy carrying using UPVC jointing pieces. It's a similar idea to the SOTA Beams MFD except that is a half wave dipole and has a T piece with a coaxial balun and can be used vertically or horizontally. The Slim Jim should theoretically have some gain over the dipole but it can't be used horizontally, which is no disadvantage as 99% of WOTA activating is done on FM. One reason I haven't used the MFD very much is the difficulty in deploying it. The antenna is provided with two velcro straps so it can be attached to a convenient fence post. Unfortunately our hilltops don't often have convenient fence posts on the summit. My intention with the WOTA Pole had been to stuff the antenna in my rucksack for support so the radiating element would be above head height. 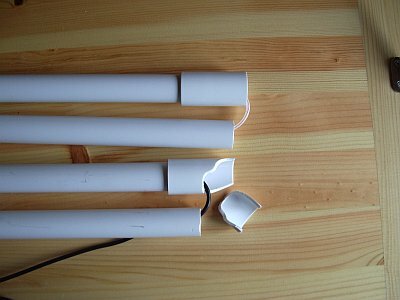 Unfortunately UPVC jointing pieces aren't very strong and it's impossible to lift a rucksack onto your back whilst keeping a 2 metre long antenna perfectly vertical to minimize the strain on the joins. As I lifted it up I heard a crack and the antenna fell to pieces! I didn't see any damage. It was quite windy up there and I thought the culprit was the wind, plus perhaps I hadn't pushed the jointing pieces tightly enough together. So instead I decided to strap the antenna to a convenient fence post which fortunately Broom Fell just happened to be equipped with right by the summit cairn. You can see the result in the photo. Lords Seat is the fell on the right in middle distance, with the Skiddaw range further away on the left. Sunday lunchtime is not the best time to go WOTA activating. I think many chasers are busy filling themselves with roast beef and yorkshire pudding and nowhere near their radios. However Colin 2E0XSD was on frequency having been following my progress via APRS. He gave me a 59 plus report on the new antenna. After a couple of fruitless CQs I started to think that was going to be the lot, then Geoff GM4WHA came up, followed by Malcolm M0XAT. Then no-one. As the wind was bending the WOTA Pole rather a lot I took it down. I then tried a couple more calls using a helical antenna and got Mark MM1MPB and Tony G1OAE. Finally Colin 2E0XSD came up again to say I was only 4 by 3 on the helical antenna. The WOTA Pole had made a huge difference. It's just a pity there hadn't been anyone further afield listening at the time. I walked down the hill a short way to get out of the wind and have the sandwiches and coffee that Olga had made for me. While I was down there I thought I would have another try at hoisting the antenna on to my back in the rucksack. Then I noticed that one of the UPVC jointing pieces - the one at the top of the lowest tube that takes most of the strain - had cracked. When I tried to get it aloft a piece broke away completely and the antenna fell to the ground. Another idea bites the dust. Literally! On the way down I was pondering what I could do to make this idea work. Clearly the Slim Jim itself performed very well. In fact if anything it worked a bit too well on receive. The VX-8GR receiver exhibited clear signs of overload. I'd noticed this before when I'd used that radio with the MFD. I should really use the Motorola GP-300. Ironic that a radio that cost me £1 at a rally works better than a fancy Yaesu costing more than £300! The problem with my WOTA Pole idea is the mechanical design. If I'd made the tube two one metre pieces instead of four 50cm lengths it would be stronger. But having something sticking 50cm above the top of my rucksack would be a nuisance when walking under low branches or ducking under fallen trees as I actually had to do on this walk. Perhaps I should give up the idea entirely and try to make a rucksack mount for BNC fitting antennas. Then I could use the telescopic 5/8 wave that I usually use on less windy days fitted directly to the radio. What do you think? what you can do julian is something that I did when i was doing sota. assuming you have a netal frame in your rucksack, take you 50 cm pieces and do it how you did it before, but instead of using the plastic joiners, use copper pipe pieces. that worked for me for the same thing. the other thing you can do is to build a copper pipe jpole which there are plenty of plans for on the net. Thanks for your comments. I do not have a metal frame rucksack. It's just a small lightweight backpack. I don't see how I could use metal jointing pieces for a tube that houses an antenna. If you are suggesting making a copper pipe J-Pole that breaks down to 50cm lengths, I guess that might be worth trying but it is beyond my skills or equipment to work with copper pipe. Good afternoon Julian, the picture is great it describes the the cool and windy weather. To bad the UPVC joint let go....I guess Murphy somehow had to get in the picture. I've seen images of old Soviet Union radio equipment that used what I thought was a clever system for their antennas. Cylinderical bead are threaded onto the wires and at the base a small "clamp" that snapped rigid putting pressure on the beads, thus making a stiffened antenna. Unsnaping the clamp released the pressure and the antenna became limp and could be rolled up and stored. I never could find a clamp like the one I saw, but I assume if you had two pieces of threaded plastic pipe, you could put pressure on the beads by unscrewing the two pieces and makeing the the overall length longer, and then screw them together to shorten the pipes to release pressure. Just a thought. either glass or carbon fibre poles will be available in pretty much any size with as 'proper' parallel tube and tapered tubes which will lock together by friction similar to fishing poles are also available. Other methods like those fold out and nearly take your eye out tent poles might also work but could mean that there needs to be a bit of thought over where the element sits. I used an MFD last friday and was a bit concerned as it bent quite badly in the wind. I half expected the sections to break but it ended up just falling over.